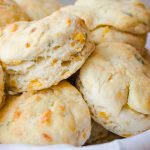 These biscuits are a great appetizer or addition to any meal. The velvety scent of fresh sage fills the house so much that it will bring your husband out of his home office asking “what’s for dinner?” You might even have to slap a couple hands away as you are prepping the garlic butter. I used to love the biscuits at Red Lobster and even bought the biscuit mix once. The last time I tried them as an adult I was disappointed in how greasy they were. I guess I didn’t mind that when I was a kid. Although the cheddar sage biscuits aren’t the same, they replace the hole in my heart where the Red Lobster biscuits once lived. If you garden, this is a perfect opportunity to use your fresh sage and rosemary. Otherwise, it’s sold in the store in the produce section or try experimenting with dried herbs. The velvety scent of fresh sage fills the house and will bring your family into the kitchen. In a food processor, add the butter and flour and process until thoroughly combined. The butter will be smaller than pea-sized once done. Place the flour and butter mixture into a large bowl. Add the baking powder, cheese, sage, rosemary, salt, and sugar. Using a fork (not a mixer, as not to overmix) slowly add in the milk while gently mixing. On a floured surface, gently roll out the dough until 1”-1.5” high. With a biscuit cutter or a large glass, cut out round shapes of dough (as you would sugar cookies) and place on a baking sheet. While baking, melt the butter and add the salt and garlic powder. Once finished baking, with a pastry brush, brush the garlic butter over the biscuits. Serve warm.